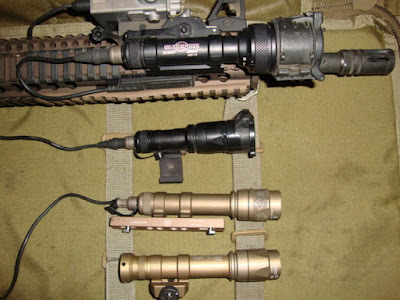 I get asked a lot about where to mount your flashlight to your rifle. I also get asked about mounting options. So I thought that I would drag out some of my SF lights with different mounting options and show you how I mount mine. I am currently running a Centurion Arms full Mil-Spec Cabine. It has a 16" cold hammer forged barrel, covered by a DD M4A1 rail. I always say that there is never a perfect set up. You will always have to compromise on something. You will always have to give up something to get something. So if you are struggling with the perfect set, just realize that everything is normal. Always remember that if it's tactical, it's not comfortable! Figure 1 shows my laser (LD D-BAL A2) positioned on the 12 o'clock rail and close to the front sight post so the illuminator beam is not interrupted by the sight housing. My flashlight, in this case a 'V' series SF scout light, positioned on the 3 o'clock rail and forward to minimize shadow created by the light hitting the weapon. I activate the flashlight by pressing the tape switch velcroed to the rail between the 3/6 rail with my support fingers. My laser switch is mounted in the opposite rail, 12/9 and is activated by my support thumb. I find this to be the best mounting solution for both laser and flashlight as it is very intuitive and allows the user to shoot day and night while activating both laser and light with the same grip. The grip forms an integral part of the recoil management system and should not be compromised to access controls. Figure 2 shows (4) different mounting options for your flashlight. The 'V' series light uses the proprietary SF QD rail grabber. I have rotated mine around so that it does not irritate my support hand. I always use an IR cover (figure-3)or black cover on all of my light to prevent white light ADs or to ensure that there is no reflection from sunlight creating shine and reflecting back towards the enemy. Another reason I keep a cover over the lens is so that is does not get blacked out by the muzzle blast. The next light is a SF mini scout light and the body has been replaced by an S&S Precision IMF Hinged mount. This is an early model and the new ones are made from one piece of aluminum. This mount allows the light to be mounted to the rail so that the light sits between rail segments and keeping it as close as possible to the gun. 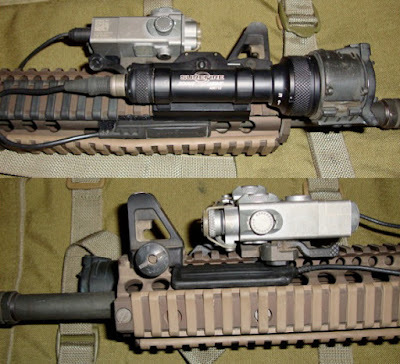 The third light is a SF scout light with another S&S Precision low pro mount designed specifically for the HK 416. This version like the previous is designed to have the light as tightly as possible to the weapon, keeping it very slick and tight! The last light is again a SF scout with the standard thumb screw SF mount that comes with the unit. My preference is still a tap switch over most others and to me honest my favorite switch of all time is the rubber SF on/off switch from the Classic series that I had on my MP5. Sometimes you need constant on! ATN? You gotta be kidding or trolling. 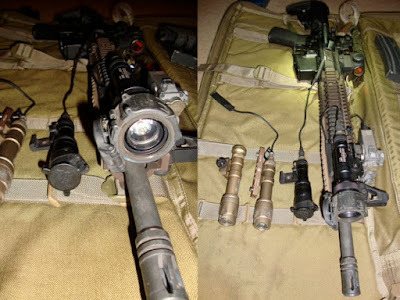 "The third light is a SF scout light with another S&S Precision low pro mount designed specifically for the HK 416. This version like the previous is designed to have the light as tightly as possible to the weapon, keeping it very slick and tight!" 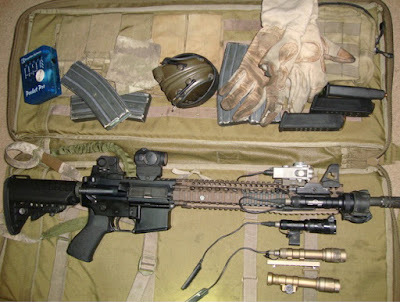 I've read that mount is designed for the HK416 RIS, does it work with the Daniel Defense RIS M4A1 rail?